The participation trophy issue…..A mom speaks out…. – What Motherhood Has Taught Me…. The participation trophy issue…..A mom speaks out…. As parents we all want the best for our children. We want them to try their best and as we encourage their efforts. We want them to be successful and well-rounded. We want them to have a sense of accomplishment as we build up their self-esteem. We want them to dream big and believe that all things are possible with hard work. We applaud their participation and we reward their efforts – but are we doing so at an unforeseen cost if we do not balance out all of this positive with lessons regarding disappointment and the fact that sometimes your best will not be good enough? 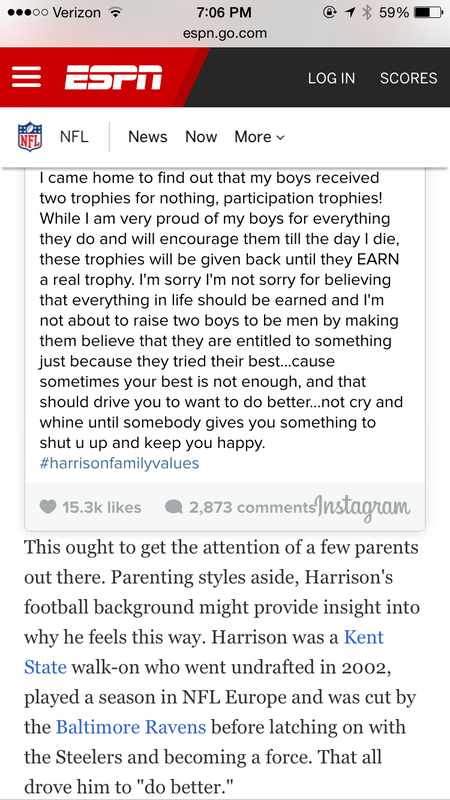 There is a very hot-button issue currently online regarding Steelers linebacker James Harrison stripping his children of their “participation trophies”. His actions have sparked a much heated online debate in which people are weighing in to voice their opinions. 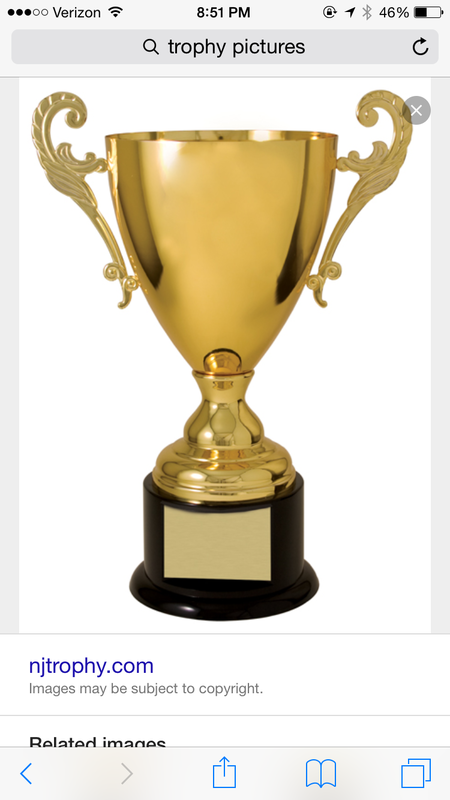 This purpose of this blog is to ask the thought-provoking question as to whether such participation trophies are of a benefit or a detriment to our children. From personal experience, my younger son received a participation trophy for playing flag football. While he was thrilled, I was less than happy, mainly because he did not complete the season. In fact he was so ambivalent to the experience that he would only participate in the practices, refusing to play in any games. He wouldn’t even sit on the bench in support of his teammates. His lousy attitude made it necessary for me to remove him from the team. This was very difficult for me as there were two lessons I had hope to instill within him. The first was the lesson of commitment – that being, you finish what you start, especially when others are depending on you. If at the end of the season he chose not to play the next year then that was fine because he had finished what he had committed to. The second lesson was that just because things were hard didn’t mean you could just quit and move on. Life doesn’t work like that and I didn’t want to be raising a quitter who never gave things a chance or saw them through just because “they were hard.” Despite my best efforts both lessons seemed to fall on little deaf ears. And to add insult to injury, at the end of the season when we went to the awards assembly in support of my older son who also played and was being recognized for his participation; to my utter shock, (and embarrassment) when they got to my younger son’s team his name was called out to receive a trophy for participating. Now in addition to failing to complete the season, he was being rewarded for it. And to make matters worse, he was grinning from ear to ear and so happy that he got his first trophy for “playing”. What message was this sending to my child? As a parent I felt it sent the completely wrong one. As a parent who is speaking solely from my own personal experiences regarding my children, I am wary of participation trophies. In fact I am wary of any participation awards as I am concerned they will and have already have created a sense of entitlement with my children. More often than not it seems as if my children are looking for a tangible reward for their efforts rather than recognizing that doing their best should be enough for foster a sense of pride and accomplishment. I worry based off of what I have already witnessed, that my children don’t know how to handle simple disappointments because of the constant mentality that “everyone’s a winner.” Case in point, board games often result in meltdowns when one of them truly wins and the other one does not. The reality of life is that not everyone can be a winner; that even when you do your best, your best might not be good enough to prevail in certain circumstances. How will my children handle the rejections that life has in store for them if they are under the misguided notion that just showing up is good enough? I personally believe that there needs to be a balance between rewarding my children at those times deemed appropriate while still ensuring that they are prepared to handle life’s challenges and disappointments. I also believe that if my children are handed things in their life that they will be unable to truly appreciate what comes from hard work. And finally, I believe that it is life’s disappointments that can offer my children the best lessons by challenging them to try harder, to refocus their vision, and re-evaluate the direction in which they are looking to aspire. Agree, a balance is needed. Kids do need to learn you can have fun, even if you aren’t the winner. No medal, no trophy, no ribbon. A clear cut “winner” and “loser” is ok, and teaches sportsmanship. At some point, we need to stop the coddling, and teach disappointment is ok, and may even help you learn something. Such a wonderful point as it pertains to teaching sportsmanship and teaching that disappointment is ok. To often in life we want to only focus on the positives, but life is two-sided. I often worry that too much coddling will in fact create more challenges for my children later on in their lives. Thank you for weighing in!!! In our household we really try not to give our children tangible rewards unless they truly have done something exemplary in an effort to instill within them the importance of hard work. However, despite our efforts as parents, my experience has been that for us this is an issue manifesting itself from outside influences. My kids will exhibit entitlement behaviors that leave me appalled at times. And being that I know that’s not what we are teaching them, it’s extremely frustrating as parents to have to go up against this. I know the feeling, trying keep up the good fight!! P.S. Thank you for weighing in!!! This is a really interesting post! I have a box in the attic full of trophies which my oldest daughter basically got for showing up to stuff, so I share your irritation! But…. I’m wary about telling my kids that their best isn’t good enough. Maybe this is a cultural/ linguistic difference between USA and UK, but to me it sounds a bit too much like “YOU’RE not good enough” which surely won’t help build anyone’s self esteem. My daughter is so enthusiastic about sport but is one of the majority who are never going to get “real” winners medals. I think we need to find a way to genuinely praise/ encourage effort so that are children are motivated to keep trying, but WITHOUT all those patronising participation trophies!